The objective of this project is to carry out a design fabrication and testing of a hammer mill, which will be used for grinding agricultural produce and mineral resources . The profile of the throat of the machine is redesigned to give better performance that was hot nit achieve when the machine was carrying the straight profile. Further more, the hammer was redesign to twisted type as against the straight hammer it was carrying formality. To achieve a better result, the sieve changing profile is redesigned to sliding type. This again allow for optimum productivity because the time consumed for changing the sieve is reduced to minimum. 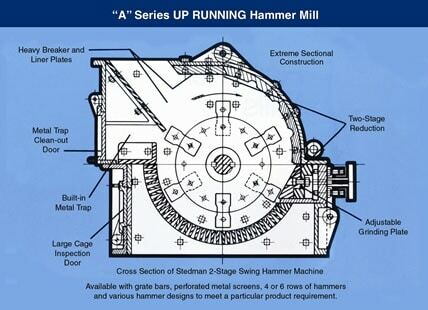 The study of project deals with the hammer mills employing a high speed rotating disc, to which an ‘n’ number of hammer bars are fixed and swung outwards by centrifugal forces.Material is fed in, either at the top or at the Centre, and it is thrown out centrifugally and crushed between the hammer bars or against breaker plates fixed around the periphery of the cylindrical casing. The hammer mill is an impact mill employing a high speed rotating disc, to which are fixed a number of hammer bars which are swung outwards by centrifugal force. Material is fed in, either at the top or at the Centre, and it is thrown out centrifugally and crushed by being beaten between the hammer bars, or against breaker plates fixed around the periphery of the cylindrical casing. The hammer mill crushes by the collisions between high-speed hammer and material, and the hammer crusher features in its simple structure, high reduction ration, high efficiency, etc. The PC hammer crush (hammer mill) was developed for both dry and wet crushing of brittle,medium-hard materials for the mining, cement, coal, metallurgic, construction material, road building, and petroleum and chemical industries. Material is reduced by impact from free-swinging bar hammers. Finished Product size controlled by grates or screen sizes. Materials can be reduced to granular powder at high rate. Heavy-duty cast-iron or carbon steel construction. Easy access for maintenance and screen/grate change.